Heat oven to 350°F. Place oven rack in upper third of oven. Carefully unroll dough on ungreased large cookie sheet. Press dough into 13x10-inch rectangle. Bake 10 minutes. Meanwhile, in medium bowl, mix tuna, mayonnaise, chiles and cilantro. Remove bread from oven. 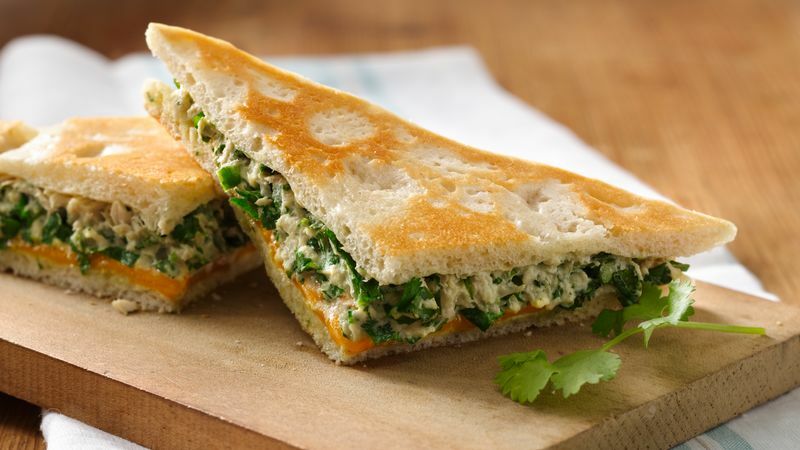 Place cheese slices on one half of the bread; bake 2 minutes longer or until cheese starts to melt. Remove from oven. Cut into 8 pieces, 4 with cheese and 4 plain. Spread tuna mixture on 4 plain pieces of bread. Top with remaining pieces, cheese side down. Heat 12-inch nonstick skillet over medium heat. Brush one side of each sandwich with oil. Place 2 sandwiches in skillet, oil side down; cook 1 to 2 minutes. Brush tops of sandwiches with oil; turn. Cook 1 to 2 minutes or until golden brown. Repeat with remaining two sandwiches and oil. Cut sandwiches diagonally. Garnish with additional cilantro, if desired.